CHERRY HILL, NJ: TD Bank has selected CooperKatz & Company as AOR following a competitive review. Rebecca Acevedo, VP of PR at TD Bank, declined to name the competing firms and the budget but called it a “sizable program” with national scope. CooperKatz replaced Coburn Communication, which did not re-pitch for the account. TD Bank selected the firm for its expertise in consumer and financial PR as well as its “like-minded culture,” Acevedo said. CooperKatz started working with TD Bank on Monday. The agency is responsible for national corporate and consumer PR, concentrated on the US East Coast, Acevedo said. The firm will work closely with JeffreyGroup, which TD Bank appointed as its first Hispanic AOR in January. TD Bank also continues to work with BackBay Communications, which has handled PR for the US commercial banking division since 2011. A team of five staffers will oversee the account from CooperKatz's New York headquarters, said agency president and CEO Anne Green. The firm will focus on strategic media relations, supporting product lines within the retail bank, and overall corporate and brand messaging, Green added. While CooperKatz has experience in the financial services sector, TD Bank is the agency's first banking client, she said. The firm has also worked with brands such as Virgin Mobile, Zipcar, Coldwell Banker Real Estate, and Canon. TD Bank's corporate communications department and strategic sourcing group led the AOR search. 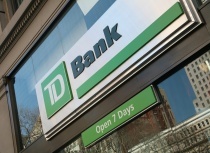 TD Bank was ranked the tenth-largest US bank by assets last year, according to SNL Financial. The bank has more than 27,800 employees and 1,300 retail stores in the US. CMO Vinoo Vijay told The New York Times last December that the company opened 41 locations in 2012 and was planning to open 30 to 35 more this year.